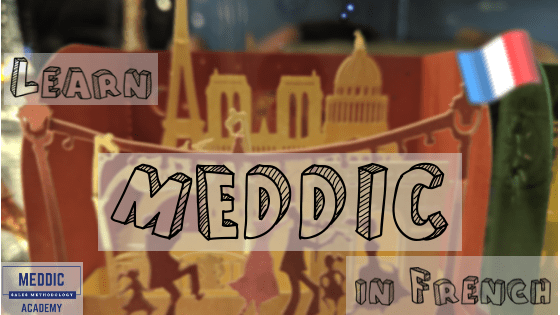 Answer: Enroll in the new MEDDIC course, in French and figure out ! MEDDIC Sales course is now available in French! The new course content, just like the English version, is mainly composed of a series of videos, totaling more than 2 hours of cumulative videos. There are seven videos, each in the range of 15 to 25 minutes, allowing users to take the course at their own pace, not necessarily all in the same day. At the end of the course, a quiz allows a self evaluation of the subject. Even though most Sales Executives in Enterprise Sales are familiar with the English language, there are always details that anyone gets fully, only in their native language or a language that they master. The new course allows French-speaking natives, to get the tiny nuances that are not always easy to capture in English. Moreover, since one of the key benefits of MEDDIC is to create a common language, slides are kept in English so that the common language is still established in English. In other words, EB or “Economic Buyer”, as an example, does not get translated; it stays as is, in English. Similar to the English version, you can try a comprehensive introduction for free, before paying for the full course. It appears like an annual subscription, as we regularly update the courses and add new content, so you can stay up to date. However, if you are only interested in a one time payment, you can unsubscribe at any time before the end of your subscription and still enjoy the updates till the end of your one-year subscription.